Never in postwar history has Germany responded so quickly and strongly as it has to the Paris attacks. Last Friday, three weeks to the day after the bombings, Germany’s parliament approved a military mission to Syria of up to 1,200 soldiers and a deployment of up to 650 extra troops to Mali. That’s Germany’s biggest and fastest initial response to a crisis in decades. In December 2001, three months after the September 11 attacks, the parliament approved a mandate for up 1,200 soldiers to join America in Afghanistan. When Mali was in crisis and appealed for help, it took two months to get a mission of only 300 approved. Germany now has four major deployments around the world—areas involving nearly 1,000 German troops: Afghanistan, Kosovo, Syria and Mali. This is the largest number of simultaneous deployments of this size that Germany has engaged in since World War ii. Of course, it’s important not to oversell the mission. Islamic State leaders will hardly be shaking in their boots to learn that Germany is sending to Syria a frigate and a handful of aircraft—which will be carrying cameras, not bombs. Nonetheless, it shows the new seriousness in German foreign policy—a Germany that has lost its former restraint in deploying its army abroad. In fact, German leaders have a far better grasp of the threat of radical terror than leaders of Britain and the United States. They’re talking about confronting Islamic terror across Africa and the Middle East. While U.S. President Barack Obama insists that, fundamentally, America’s strategy is working, German authorities emphasize the need for a widespread war to contain the Islamists. “It is not enough to tackle the [Islamic State] in Syria,” he said. He called for “robust, battle-powerful forces” to be stationed in Mali. Former inspector general of the Bundeswehr Harald Kujat had a similar message, warning that even if the West destroys the Islamic State in Syria and Iraq, it “will not be totally defeated.” Instead, it will “dodge.” The Islamic State is already setting up shop in Libya and it’s spreading into Mali, Kujat warns. A clear consensus is emerging from the leaders involved in military decision making: Germany’s military must confront radical Islam across a range of battlefronts stretching from northwestern Africa to Afghanistan and Central Asia. Trumpet editor in chief Gerald Flurry described exactly this response in the July 2013 Trumpet. Germany sees the rising threat of radical Islam and is “planning for the bigger war to come,” Mr. Flurry wrote. The nation’s response? A “whirlwind strategy.” It is surrounding radical Islam and preparing to confront it, he explains. Arguing that Germany must confront radical Islam across a “ring of fire” exactly describes this strategy. This strategy also explains Germany’s presence in Mali. What Germany is doing in Mali lies somewhere between building a military outpost and launching a wholesale takeover of the country. It’s part of a bid to cement Mali as the anchor of Germany’s whirlwind strategy in the region. Germany has around 200 soldiers stationed in Mali as part of a European Union training mission—with parliamentary permission for up to 350. It now has a mandate for another 650 as part of a United Nations mission. That’s a serious presence—close to 1,000 soldiers—for a country traditionally reluctant to send its troops abroad. It also shows some serious commitment from Germany—Mali is one of the UN’s most dangerous missions. France currently has around 1,000 soldiers in Mali, but it is expected to draw down that number once the extra German troops arrive. This will leave Germany leading the largest contingent of Western troops in Mali. Germany is currently leading the EU’s military training mission. It also heads up the EU’s civilian mission to train Mali’s police force. Despite this being a “civilian” mission, German soldiers are doing the training. To sum, Germany is about to become the dominant European military in the country. It is also in charge of training Mali’s army and its police. The latest deployment has been billed by Germany as a response to the Paris attacks—a move intended to allow French soldiers to deploy elsewhere. It’s not. Talk of a new major deployment to Mali was common in October—weeks before the Paris attacks. German Defense Minister Ursula von der Leyen told the Bild that she wanted the Army to become more involved in Mali on October 18. The Army began studying an expanded military mission in the region. The Frankfurter Allgemeine Zeitung wrote that one report the Army drew up sounded like it was describing “their next mission in a war zone.” Rainer Arnold, defense policy spokesman of the Social Democrats, Merkel’s coalition partners, said that he expects a large contingent of German soldiers to join the UN mission in Mali. 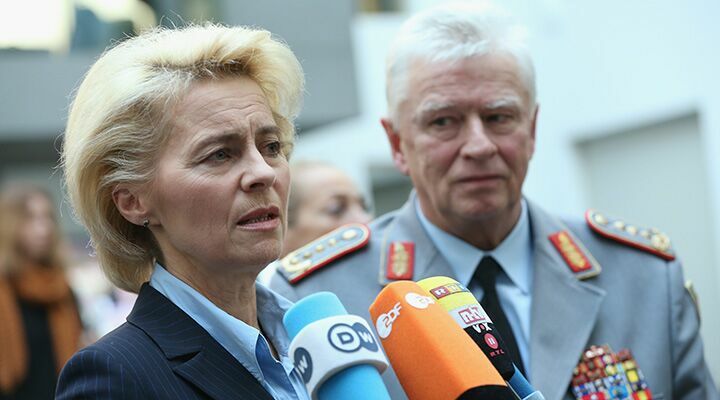 Lt. Col. Michael Hanisch of the Federal College for Security Studies, a think tank responsible for advising the German military, wrote that von der Leyen’s plans would require a “largely independent and robust operational command” and a deployment of “up to 700 soldiers and more.” Such a sizable deployment to a dangerous region would “mandate a new quality of … German military commitments in Africa.” Again, all this was before the Paris attacks. The Mali deployment is part of Germany’s preexisting “whirlwind strategy”—not a response to Paris. Germany’s military wants to use Mali as its main base in the Sahara—a point from which it can project power right across North Africa. Mali plays a “crucial role” as a “source of conflict” and a “hub of refugee routes to Europe,” wrote Colonel Hanisch. He wrote that von der Leyen sees Africa “as the future focus of the German military commitments,” and this puts the focus on Mali. “This is a major operation that cannot be limited to Mali,” cdu’s Roderich Kiesewetter said in an interview with Deutschlandfunk, a German public radio station, once the mission was officially announced. “It is important in the long term that we think of Libya,” he said. He also described how weapons and terrorism spread across the region, from Nigeria to South Sudan. France has several military bases in African countries that it virtually controls, which it uses to project power across the region. Germany has apparently decided it wants the same setup in Mali. Compared to the transformation of Mali into a German protectorate, the Syria deployment is a little less dramatic, though still significant. Once again, the German response taps into long-standing goals. The German Navy is very familiar with this part of the Mediterranean. Initially it led the maritime component of the United Nations Interim Taskforce in Lebanon, and it has remained involved as the leadership rotated to other nations. It has also been training the Lebanese Navy. The return of a German frigate to these waters is not surprising. Germans have also deployed before on Turkey’s borders. The nation recently had a 200-strong mission to man two Patriot missile batteries, protecting Turkey from any missiles that could be flung its way from Syria. Now, Germany’s looking to station around 550 soldiers in Turkey as part of its reconnaissance and air-to-air refueling mission in Syria. All this will draw Germany deeper into the Middle East. At the same time, it will force the military to increase its combat readiness and logistical support. Over the last few years, Germany has launched a serious push to keep its forces in better repair and its personnel better equipped. Germany’s postwar army was designed for one purpose: to throw as many tanks and men as possible up against a Soviet invader. Deploying and maintaining large contingents of troops hundreds of miles away from their home country requires an entirely different skill set. The fact that Germany is now able to maintain four separate deployments of nearly 1,000 soldiers each shows how much progress it has made here—and it will also force it to progress further. “However, we see these days how quickly the federal government can pass a red line,” he added. Will this Syria mission be the start of much more comprehensive German involvement? The Paris attacks and the migrant crisis are prompting Germany to accelerate its whirlwind strategy. The idea that Germany is planning to effectively confront radical Islam has implications for everybody. Currently, the Islamic State is the big name in radical terror. Many terrorist groups across the Middle East and North Africa have pledged allegiance to it. But these groups also have deep and long-standing ties with Iran. We have long forecast that Iran would emerge as radical Islam’s leader.